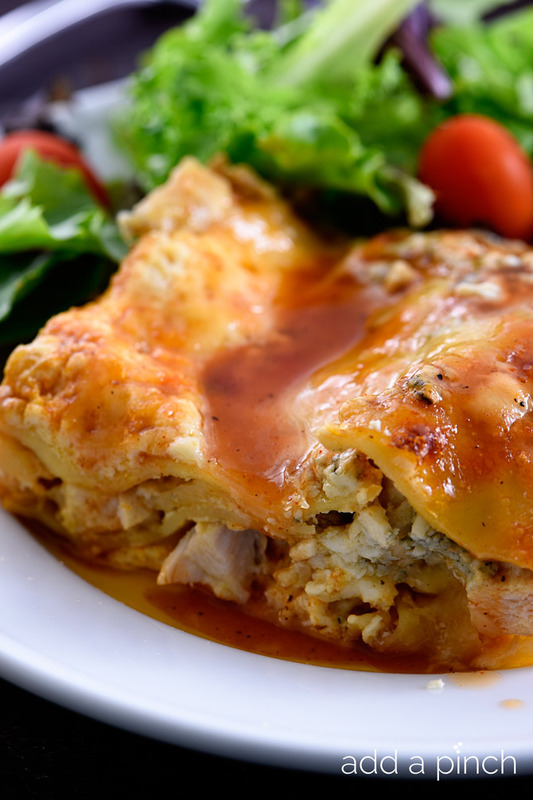 Buffalo Chicken Lasagna combines two favorite dishes in one – buffalo chicken and lasagna! Oh my goodness. If you guys like buffalo chicken nearly as much as my family does, then this recipe is going to be one that you have to try. 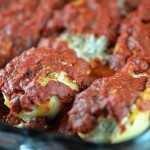 I love to prepare this dish as a make-ahead to help me throughout the week since it makes a huge recipe perfect for serving a crowd or serving for a couple of meals. But, you can also take this recipe and divide it in half into smaller baking dishes, bake one for now and freeze the other for later or even for sharing. Talk about a win win! 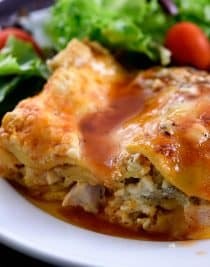 To make this buffalo chicken lasagna, I start by cooking boneless, skinless chicken breasts that I’ve cubed along with onion, celery until the chicken is browned and cooked through and the onion and celery are tender. Then, I stir in the garlic and cook it for a minute or two before adding in my diced tomatoes, the majority of my homemade buffalo sauce, a little water and salt and pepper. Let me tell you guys, that mixture is pure heaven right by itself and is perfect to go on salads or mixed into so many other dishes. While my chicken mixture is cooking, I have another pot going to boil my lasagna noodles. Of course, you can use the no-boil variety or replace the noodles with zucchini sliced really thinly instead. Both work just as well and are amazing! Once the noodles are ready, you’ll stir together your ricotta cheese and some blue cheese and start layering for lasagna! You’ll bake for a while covered and then bake the remainder of the time uncovered until the buffalo chicken lasagna is bubbly and the cheese is melted. Remove it from the oven, pour on the remaining buffalo sauce and let it stand for a few minutes before serving. Here’s my Buffalo Chicken Lasagna recipe. I think you will love it! 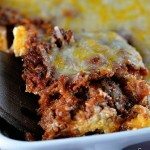 Buffalo Chicken Lasagna makes a delicious twist for the buffalo chicken and lasagna lover! Preheat oven to 350º F. Spray 9x13 baking dish with nonstick cooking spray and set aside. Drizzle oil into a 3-quart Dutch oven over medium heat. Add chicken, onion, and celery and cook until meat is no longer pink and vegetables are fork tender, about 10 minutes. Add garlic and cook for another minute or so until fragrant. Then stir in tomatoes, 3/4 cup of buffalo sauce, water, salt and pepper. Bring to a boil and reduce the heat to simmer and allow to cook about 5 more minutes. While chicken mixture is cooking, cook lasagna noodles according to package directions and drain. Mix together the ricotta cheese and half of the blue cheese. Layer baking dish with three noodles, 1/3 of the sauce, 1/3 of the ricotta mixture, 1/3 cheddar cheese, 1/4 of the mozzarella cheese, and 1/4 of the blue cheese. Repeat layers twice. Sprinkle with remaining mozzarella cheese. Cover with aluminium foil and bake for 20 minutes. Then, uncover and bake 20-25 minutes or until the lasagna is bubbly and cheese is melted. Remove from the oven and sprinkle with remaining blue cheese. Let stand 10 minutes and top with remaining buffalo sauce before serving. That would be tempting just to eat the Buffalo Chicken by itself. Sounds yummy. What a fun recipe! Two of my favorites combine! Genius. 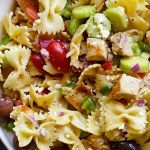 What a great spin on a classic recipe! A great crowd pleaser for sure. Oh I really want to try this! I’m wondering though how it would turn out using boneless skinless thighs, my husband is not a fan of chicken breast. Boneless, skinless thighs should work just fine in this recipe, too. I hope you enjoy it! Robyn, this looks amazing!!!! I love buffalo chicken! I know what my boyfriend will want for dinner! I can’t wait to try this! What a fun twist on the classic! 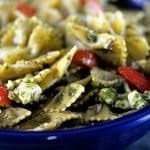 I am wondering what could I replace the ricotta with. That’s the only thing my son doesn’t like. Also, just read one of your posts (I think about the Dutch baby) mentioning you went to Switzerland and other nearby countries. Did you stay in the German part of Switzerland or visited other areas? I am from the French part of Switzerland on Lake Geneva. I’m not a fan of blue cheese. How could I replace with, say, a ranch substitute? You can use another cheese in place of the blue cheese. I would recommend something like Monterrey Jack. Made this tonight for dinner with only a couple of tweaks. This is a really excellent recipe. I just added a bit of heavy cream to the sauce and used my own Buffalo sauce. Of course, now I have leftovers for the world as it is just my husband and me :D. I also made your chocolate cake for dessert. Just me, having fun on your website today. I am going to make this on the weekend. I’m wondering about your Buffalo Sauce Recipe though. I’m not sure I would like the vinegar and worcestershire sauce. How do you think it would be if I just used the butter and hot sauce? Looks soooo amazing. My mouth is watering already! Thanks! I made this on Saturday. Wow!! It was awesome! It was even better the next day heated up. This one gets two thumbs up! Super tasty! My boyfriend ate 3 helpings so I guess he liked it!! I added a green bell pepper and a couple extra oz of bleu cheese. Bought a 6 oz container of Bleu cheese so I threw it all in! Also, I took a little shortcut and just used Franks Buffalo Sauce. It turned out fantastic especially since this is only my 3rd time making lasagna. What an awesome fusion, my boys would love this! 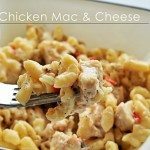 I enjoy getting your recipes and the ones I have tried are delicious! I want to make this but you said you could use thinly sliced zucchini instead of lasagna noodles. Does the zucchini “noodles” get mushy after baking? I have one large zucchini left and would love to use it in this recipe. Any advice or suggestions are greatly appreciated; thank you! I’m so glad that you are enjoying the recipes! The zucchini in this recipe doesn’t get mushy, but does get tender. I hope you enjoy it! Robin I’d like to make this for my boyfriends surprise party. I need to make it two days in advance and bake it day of OR make it and bake it two days in advance then reheat it in the oven day of. Would either of these options work? Surprises are tough. I should be just fine to make it two days ahead and bake on the day of serving. Just a question, 3 chicken breasts, not cut up? Then you list cubed up chicken breasts. Is it the 3 chicken breasts cubed up and not both? It’s only the 1 1/2 pounds, or about 3 chicken breasts, cubed. Hope you enjoy it! Thanks!